Possibly our favourite of MeldaProduction's multiband plug-ins, this one can do everything from subtle enhancements to extreme effects. Superb multiband architecture. Excellent modulation system. A, B, C and D state morphing. Huge range of possible effects. The coding robots at MeldaProduction stop at nothing to produce a constant wave of plug-ins. In recent issues we've looked at several of their numerous multiband offerings, each of which takes a familiar effect (distortion, chorus, etc) and runs with it, adding a multiband architecture and modulation options aplenty. This time we're trying MMultiBandFreqShifter, which is - wait for it - a multiband frequency shifter. It would be understandable to assume that frequency shifting and pitchshifting are basically the same thing, but in fact they're pretty different: pitchshifting maintains the harmonic relationship between frequencies whereas frequency shifting moves all frequencies by an equal amount. Let's look at an example. Say our input signal is made up of a 1kHz fundamental with a harmonic at 2kHz - the harmonic is at double the frequency of the fundamental, ie, they're an octave apart. If we pitchshift this by a factor of three, we multiply the frequencies. The resulting frequencies should be 3kHz and 6kHz - 6 is 2x3, so the octave relationship is maintained. If we were to frequency shift this by 2kHz (ie, adding instead of multiplying), the result would be 3kHz and 4kHz. The octave relationship is not maintained here, and the more the frequencies are shifted, the more the original relationship will be destroyed. As with the other MeldaProduction multiband jobs we've looked at, this latest effort features up to six adjustable bands; analogue, digital or hybrid crossover filters; fully automatable parameters with four global modulators; host synchronisation with a comprehensive set of beat divisions; mono, stereo or eight-channel surround processing; and up to 4x up-sampling for higher-quality output at the expensive of an increased CPU hit. The main action takes place in the central window, where you'll find the following per-band parameters: Shift (+/-10kHz); Width (+/-200%); Delay time (0_1000ms); Feedback; Character (quality) of frequency shifting (Clean, Soft, Rough and Ugly); and Dry/Wet mix. Clicking a band at the top of the GUI brings up its individual settings. These enable you to process each part of the frequency spectrum in a different way, though it is easy to make a mess of things if you have too many bands on the go simultaneously. In the top bar of the central window is the highly useful Link button: when engaged, this causes parameter changes to be mirrored by other linked bands. There are Copy and Paste functions, too, so you can achieve the same thing manually. There's also a small button for Prefiltering: this removes extremely high and low frequencies, which can induce aliasing artifacts when shifted. These artifacts can sometimes sound rather cool, so it's great that the filtering isn't done automatically. We found that MMultiBandFreqShifter is capable of producing a huge variety of different effects, from detuning, stereo expansion and chorusing through to adding harsh metallic resonances, dubby tape-style delays and full-on Doppler-like frequency shifts. What's more, it can be used on practically any audio source you can think of - drums, bass, leads, pads and FX all are fair game. 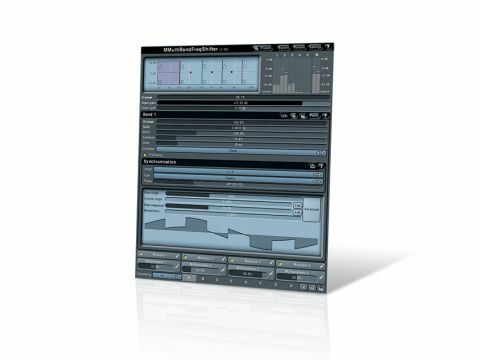 You can almost 'play' MMultiBandFreqShifter by moving its parameters in real-time, or go deeper by setting up complex modulation routings via the highly adaptable LFOs and multiparameter options. You can even morph between up to four 'states', which opens up a whole world of sound design possibilities.